This section allows you to present a number of ideas/designs. You should aim to produce at least six different designs and certainly not less than four. The more designs you produce the better the mark you will gain. However, if your ideas are very similar, the final marks will be reduced. Try to present designs that look individual and are imaginative. 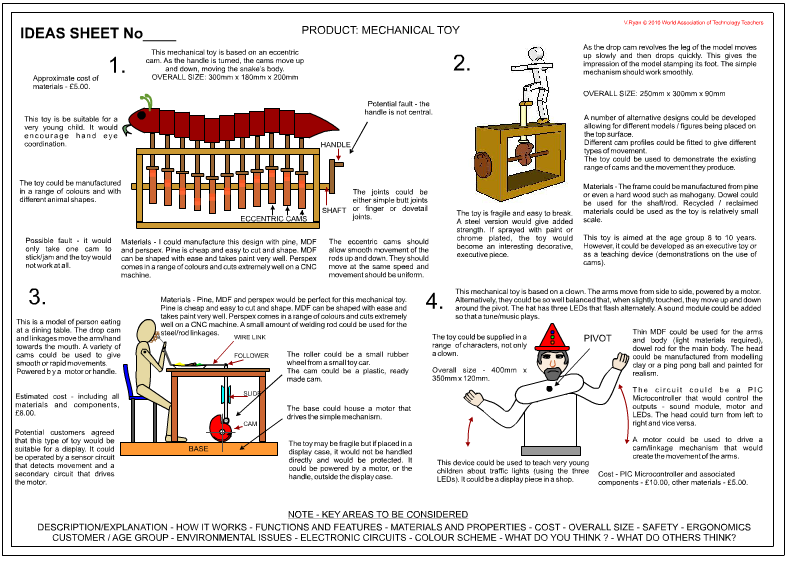 Whenever you present an idea or draw an existing product you must add plenty of explanatory notes. This applies to all parts of your project including research and ideas sections. 1. What do you think of the design? 2. What do you think of the colour scheme? 3. How much will it cost to produce? 4. Is the design safe? 5. Will you buy it? 6. Will you find it useful? 7. Does your idea answer the design problem? 8. Is the design too large or small? 9. Is it designed ergonomically? 10. Will it suit the age range that it is designed for? 11. What materials will be used in it’s manufacture? Why? You may find these questions useful as they will get you thinking about what should be written as notes next to each drawing. Always make sure that the notes are a good paragraph in size, easy to understand and well presented. Alternatively, arrange the notes around the idea. Print in block capitals or adopt a simple style of writing. Keep to the same style for this section of the design process. 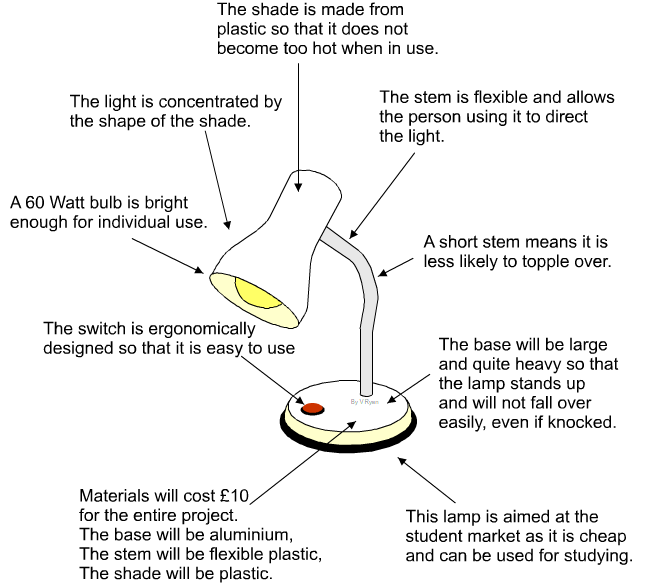 The diagram below shows how an idea with its notes can be set out on a design sheet. What Style of Drawings should I Use? 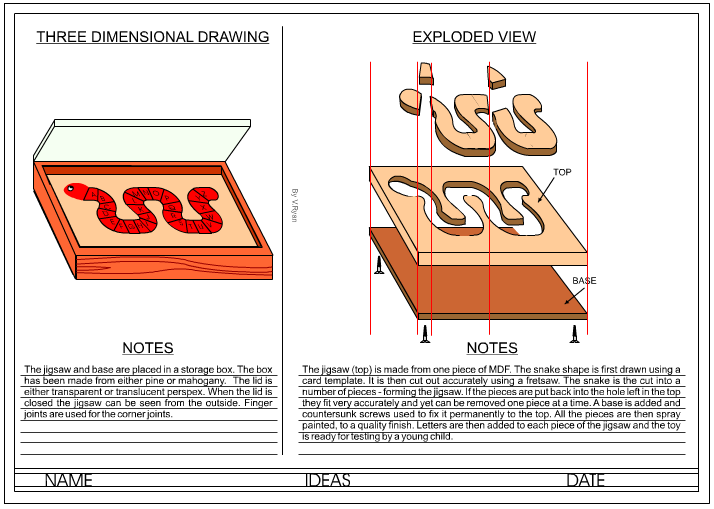 You should use a mixture of two and three dimensional drawing techniques to present any ideas. Use a number of the above techniques and before you decide look at some examples. Use two to three of the above techniques. Use appropriate colouring techniques and try not to crush all your ideas on one sheet. Two to three ideas per sheet is just about right. Sometimes the best way to start designing is to take an existing design and alter/improve it. This is probably what most professional designers do. One of the most important sections of a design project is the ideas section. Drawing designs / ideas is possibly the most enjoyable aspect of project work. This is the section in which you must show your imagination. The examiner will look closely at the ideas you produce and the way you present them and the quality of notes you include with each. Try to produce a minimum of four ideas and aim for up to six well drawn and annotated ideas. You may wish to start by looking at an existing idea and altering it / improving it. Be innovative. 1. 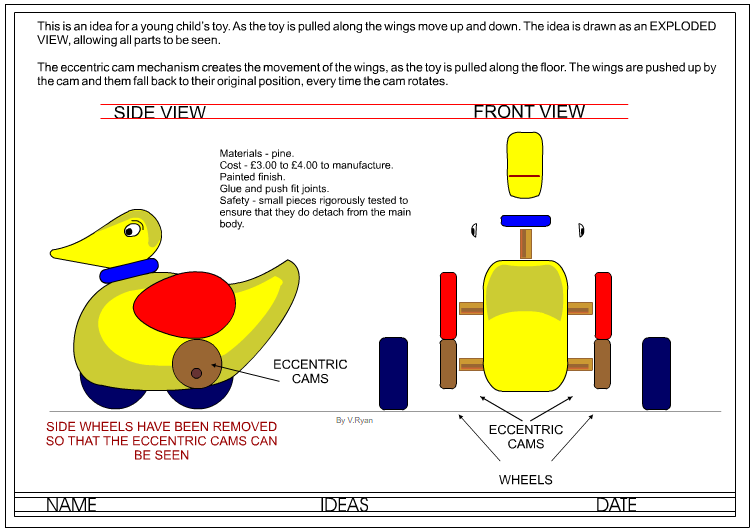 Research very carefully into ideas / products that already exist. The internet is usually a good resource. 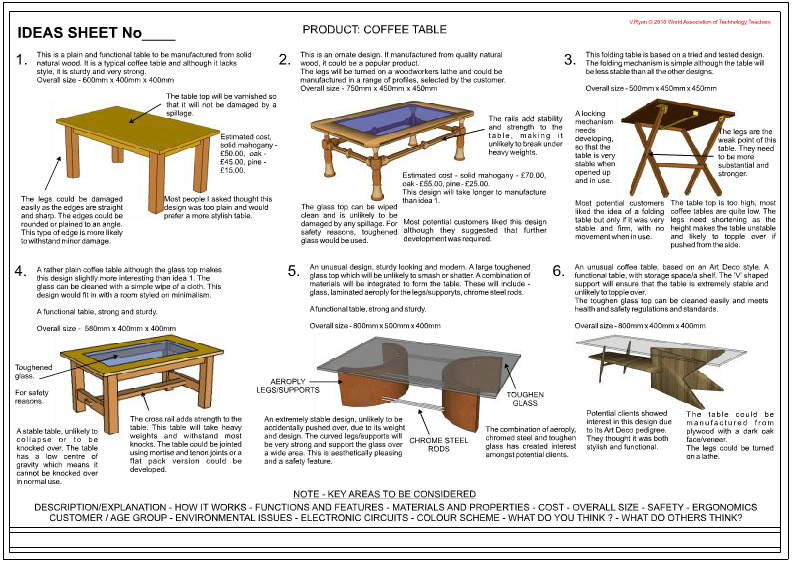 Looking at existing designs will help you design your own product. 2. Always include plenty of relevant notes. A. What do you think of the design? B. What do you think of the colour scheme? C. How much will it cost to produce? D. Is the design safe? E. Would you buy it? F. Would you find it useful? G. Does your idea answer the design problem? H. Is the design too large or small? I. Is it designed ergonomically? J. Will it suit the age range that it is designed for? K. What materials will be used in it’s manufacture? Why are they suitable? 3. Keep your drawings simple and clear. You may wish to draw your idea from different angles, in perspective, isometric, from the front, top or side. 4. Add colour and shade but do not spend too much time on this aspect of each drawing. Sometimes it may be better to keep a design to a ‘line drawing’, without any colour / shade. 5. Ask the views of other people, especially if you are drawing rough designs before transferring them to your design sheets. You may learn a lot from the views expressed by other people. 6. When you write your notes about each of your ideas tell the truth. You may concentrate on the way the idea needs improving rather than concentrating on all the good points. 7. Produce a range of different ideas not a number of similar looking ones. A. Draw rough ideas first and ask the opinion of other people - keep notes about what they say. B. Draw clear designs, keep each one simple. D. Draw between four to six ideas. Remember, each design should be different. E. Complete your homework on time. Do not fall behind as you may find it impossible to catch up.